Most travellers feel lucky to get a quick ferry stop at an island like Santorini. But small samples aren’t the Greek Island Hopping style. 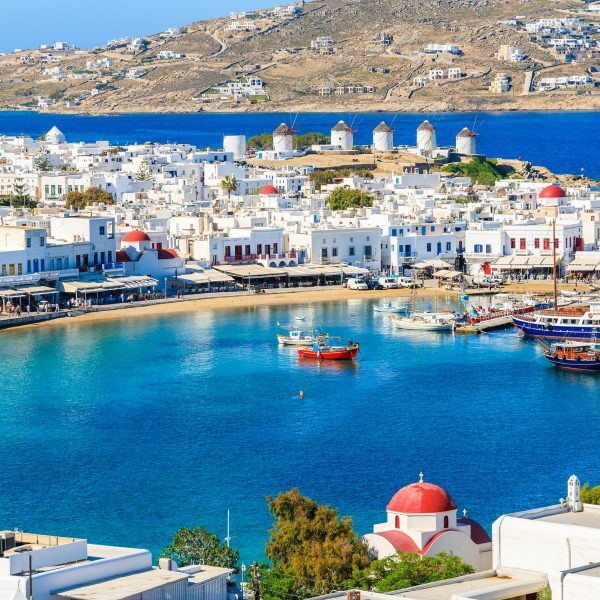 With 3-nights in Mykonos, Ios, Santorini & Athens, you’ll have plenty of time to explore charming fishing villages, shops, volcanoes & spotless beaches, getting deep beyond the ouzo and the olives and the ancient statues. Was $2225. Save upto $222. Good morning island lovers! Welcome to Greece, and welcome to the best holiday of your life. Yep, big call on day 1 but we’re making it! The day is yours to settle in to our hotel & start getting to know the city. Later, we’ll join forces as a group & start firing up the fun over dinner. Yes, yes, you’re hearing the call of cocktails on Mykonos Island. But let’s get acquainted with Athens for a day before we set sail. This city is a time capsule of life on earth. We’ll give you the chance to do an Athens’ Past & Present Tour including the iconic Acropolis and Olympic Stadium, and enjoy a traditional Athens affair in the eve via the famous Plaka area of the city. Let’s do this! 3 nights on the island of Mykonos, how did we get so lucky? Even the boat ride across the Aegean will have you awe struck and in love. Here we are on yet another day when it feels completely fabulous to be alive. You’re still in Mykonos baby! And the day is yours to soak up sunshine and play in the sea. Windmills; cafes overflowing with olives, feta and tzatziki; storybook streets – and that’s before you’ve even taken a dip in the ocean! Explore with the crew, take up a few optionals, or simply waste the day away as you please. Saddle up! We’re taking to the seas again, this time in search of the island of Santorini. It’s finally your turn to be the one lulling about the white-washed blue dome churches looking like a sultry summer babe. Home to the famous Oia sunset, this is the stuff dreams are made of. Ah, life. 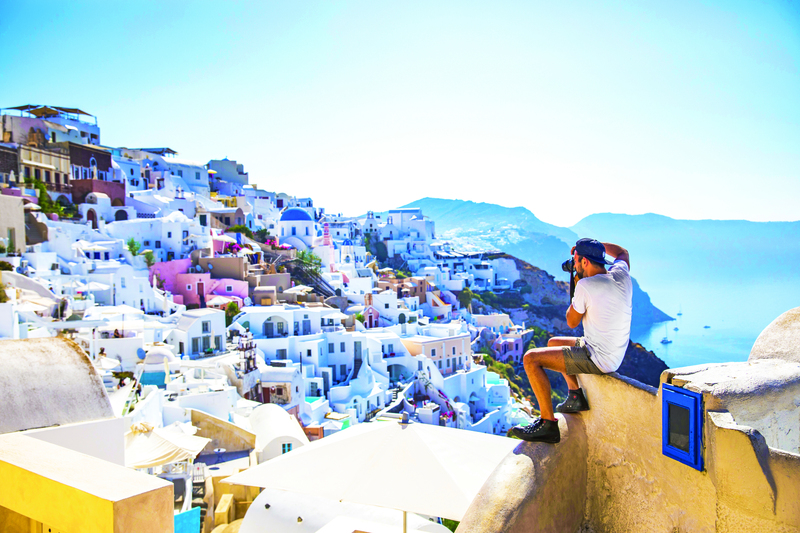 Rise and shine, Greek Island travellers! The island of Santorini will not explore itself. Take a swim at Perissa Beach, eat the local specialty of fried tomato balls known as domatokeftedes, and roam the streets of Fira. 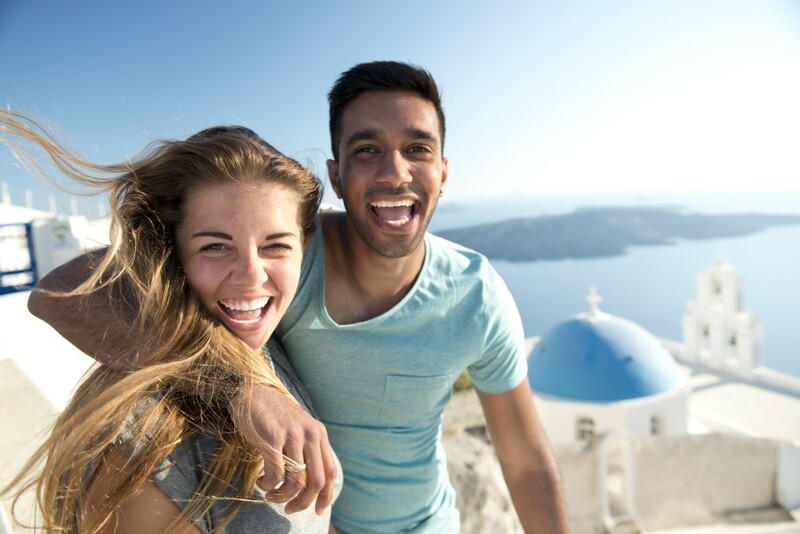 Just remember to plan your day around the excursion to the iconic sunset of Oia – this is not an optional you’re going to want to miss. The beautiful thing about having two full days on the one island is you have time to both relax and explore. Whatever you didn’t do yesterday is still up for grabs today. If you feel like you’ve crammed it all in already, just head to the black or red sand beaches and spend another glorious day ocean-side. Ain’t life grand? 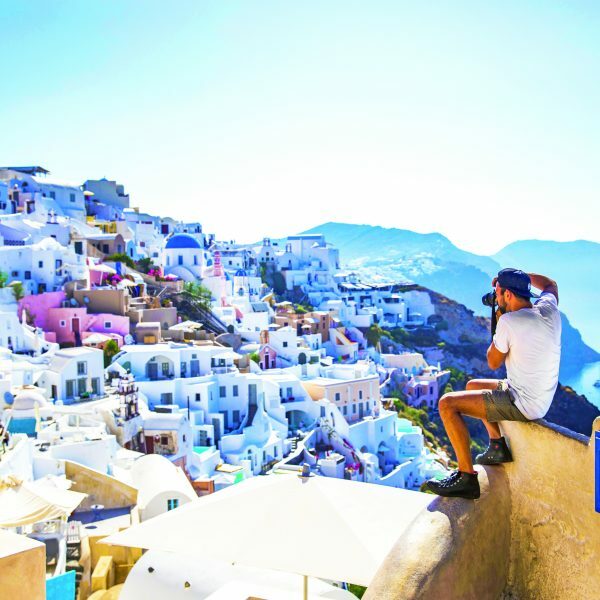 Say your so longs to Santorini this morning. 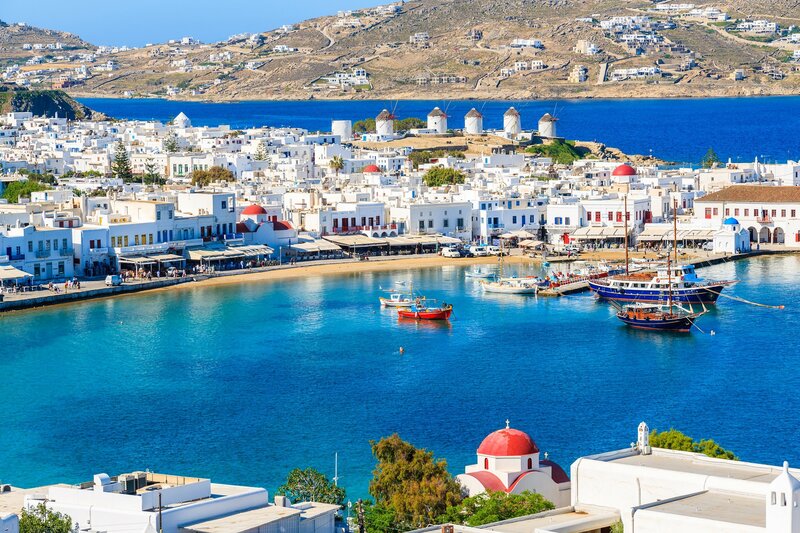 We have one last Greek Island to hop to, and we promise she’s magnificent. A bit more rugged and remote than Santorini and Mykonos, Ios will prove a nice change of scenery. But thankfully, there will be no change in the hours spent ocean side and good times had. Another day, another chance to soak up the Greek sun and frolic in the sand without a care in the world. Get some adrenalin in with some watersports, or if you haven’t done so already, go explore the pretty town and down a hearty meal at a local cafe. You’re going to need the fuel if you want to hang out in the party scene of Hora until the break of dawn. Don’t underestimate the power of this village. When the sun sets, this place really comes to life. As such, we suggest a day out on the water getting salty on a boat trip, or a full day of pool hangs and beach time so you’re all sun-kissed and feeling floaty by the time the night rolls in. While choking back the tears and waving miserably at the dreamy islands of Greece, try to think positive thoughts: we have a boat ride to enjoy this morning, as well as one more night together in the city of Athens. One last dose of Athens and one last chance to hang out together as the Greece loving squad that we are. Hugs, tears, and a final batch of reminiscing; it’s astounding how close a group can get in just two short weeks. Nothing says bonding quite like the good life. The Croatia Island Hopper is probably the only way to really ease the pain of this goodbye.